It goes without saying that London offers plenty to keep you busy recreationally; even if you committed to trying a different restaurant or attraction every day of your residence here, you’d never cover it all. That said, you may not even care to cover it all, opting instead to establish and frequent your neighbourhood haunts…make it about the quality, not the quantity. Alternatively, you may wish to seize any opportunity possible to escape the bustle of the city for the villages and landscape of the countryside or coast. If you fall in this last category, my new Day-Trippin’ series of blogs is for you. My most recent venture outside of the city took me South to Bournemouth, easily accessible by rail. There was yet an abundance of beach-goers this late in September, splashing in the sea, building sand castles, or simply reading a good book on a beach chair or the porch of a quaint beach hut. These huts seemingly stretch for an eternity along the coastline, offering a sweet little beach bungalow that renters equip with all the comforts of home, including the essential stove and tea kettle. Sunny or grey, the tranquility of this locale never ceased; somehow even with masses of people abounding on the beach, the pier, or the local restaurants, all felt quiet and meditative. 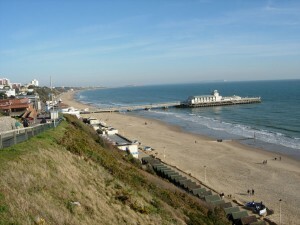 The surrounding hotels and shops create a posh environment, rendering it not surprising that Bournemouth is a popular tourist spot for UK residents. Leaping out of the sea to bound into the forest, our mini-roadtrip took us to New Forest National Park for the evening, as we pulled into Green Pastures Farm to set up our campsite. The forest itself has an unexpected landscape, in some parts looking more like something Hemingway would have traversed on safari than jolly ol’ England, and it is certainly not lacking in animal life (because it is NOT safari country, please do not shoot them…). Our drive to the farm was comical, with random barnyard animals wandering along the highway with seemingly wild abandon. I regret that we didn’t allow enough time for this, but the national park has a series of nature walks from which to choose, for which I absolutely hope to return. In the evening, we wandered over to the nearby Compass Inn for a grand English country dinner and a few pints–the locals were rather surprised to hear our American accents, indicating to us that this is a locale off of the worn foreign-tourist path. Such are the opportunities you ought to seize when becoming a resident, not tourist, of London, so be certain to ask your British colleagues what they do for pleasure to generate original ideas for local travel not highlighted in the mainstream guidebooks.